I swear the older I get, the shorter my attention span becomes. I just don't have the patience to knit an entire sweater anymore unless it's one of those made with super chunky yarn on massive needles so it's done in a few hours. But those sweaters are too hot to wear, so what's the point? So, I have been amusing myself with small projects, patterns that can be completed in no time at all. This is a small purse made with a combination of wool yarn and a little bit of shiny strands of something. The silver is just enough to sparkle here and there. My sister gave me the dyed batting for Christmas, and I discovered a friend in town spins yarn from her angora rabbit. 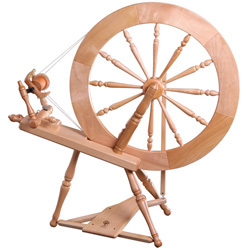 She spun this for me, and I had just enough for the purse. I used a Lion Brand pattern to knit this shopping bag. It's straight garter stitch all the way through, knitting two strands at a time. I decided to buy some interesting yarn from a small shop instead of using the recommended yarn and colors, and that's the problem. I didn't understand how the two strands were used together, and my colors do not match! What a waste. I was delighted to see my cat, Mike, likes the thing as a pillow at least. This scarf is a keeper, though. Made from another Lion Brand pattern, it's a simple garter stitch zigzag scarf (start with 2 stitches. Increase one stitch with each row until you have 27 stitches. 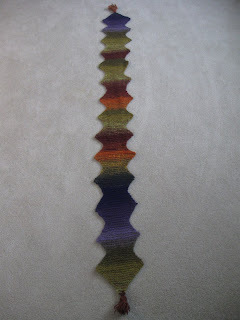 Decrease one stitch with each row down to 14 stitches, then work back up to 27, and so on). 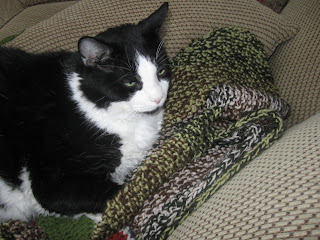 I used two balls of Noro yarn, which is a striping yarn I really enjoy working with, and I always love the results. If I make this again, I'll use at least three balls because I like long scarves that wrap. Now what will I try, I wonder? So good to hear from you again Scout. Sorry we've been out of touch for a while. 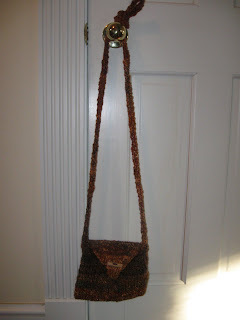 That purse is lovely - and all the more classy for being made from handspun! Current WIP is a chunky cardy. Too warm? Have you been in England in the winter? Brrrr.